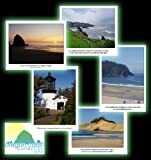 Ten beautiful blank notecards with various images of the Oregon Coastline. Includes envelopes. Meaninful quotations on the front and back of each card.